Today I kind of literally have a treat for you. A treat in the form of a guest post about something that makes me happy: coffee! 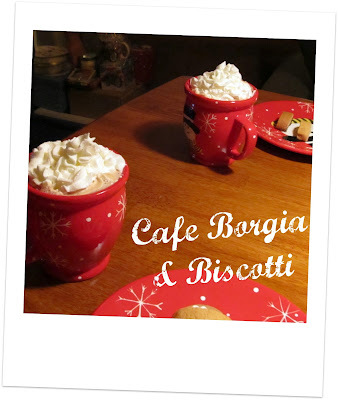 And a treat in the form of a yummy coffee recipe from the Coffee Lovin' Mom herself! So excited to be able to bring our usual Friday coffee chronicles to Just Jennifer! Besides that, it's my blogoversary today (2 years) and I'm taking the day off! Mmmm... Easy-peasy, right? I actually mix coffee and hot chocolate all the time and call it a "homemade mocha"! Coffee is something that makes me HAPPY, but what makes YOU happy? Comment or post, grab the TGIF button and link-up! Yummy!!! I was in highschool when I discovered the joys of combining hot chocolate with coffee (which I did not drink at the time . . . oh how things change). Hum, now I wonder if there is any hot chocolate here at work so that I can make something like this . . . off to check! Thanks for being here! And good job keeping us Jennifers straight! Sounds delicious! I wish I had the ingredients to try this immediately! mmmwhipped cream! I bet you buy some hot chocolate mix next time you are at the store Sabrina! You will really know yum if you try it! YUMMO! and i love that it's sooooooooooo easy. Let us know how you liked it if you do! Please do let us know - I love getting feedback! and the only thing better than coffee, is coffee and chocolate together. I think the orange sounds like a nice twist - will definitely have to try this! "You had me at.." is such a great thing to say! I've heard the orange is good, I just can't get into it..
Mmm sounds delicious! Happy Blogiversary, Amy! Throw in a shot of brandy and you've got all four of my favourite food groups. Bailey's would go good too! You had me at whipped cream! This sounds good, the orange peel might be ok. Thanks for sharing the great recipe! Whipped cream makes everything better! Yum! Sounds good to me, but I think I'd leave out the orange peel. Congrats on your blogiversary! I did the same - I think people either love it or hate it.. So glad you did this, Jen!! and oh my YUM!